Reading and share top 6 famous quotes and sayings about Reunited Love by famous authors and people. Browse top 6 famous quotes and sayings about Reunited Love by most favorite authors. 1. 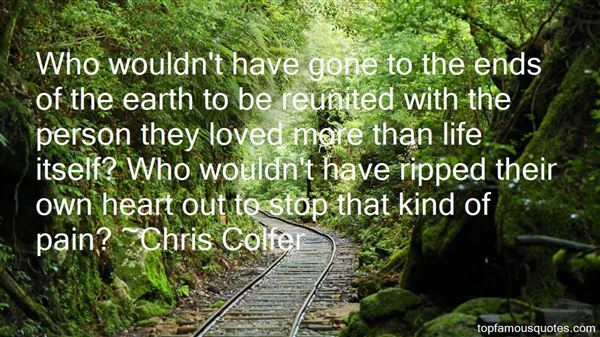 "Who wouldn't have gone to the ends of the earth to be reunited with the person they loved more than life itself? Who wouldn't have ripped their own heart out to stop that kind of pain?" 2. "It was floating. Waiting. It had no sense of how long It had been in this state. Its awareness had retreated into a tiny core at the center of Its being, away from the searing torment of separation, Its very essence ripped apart. Never had It known such sensation. So It had retreated, further and deeper, wrapping Itself in a cocoon of Light; waiting only for a call, for an opening, that It might be reunited with Its Beloved. Waiting until... Something stirred within. Suddenly, there is a reaching, a pulling. Its awareness opens and It is caught in a field of gravity. It plunges down, irresistibly down toward the blue planet, unable to control or navigate." 3. "Whispers of a forgotten shoreWhen I die, throw my ashes to the wind…Let it carry me along as my heart will lead my soul,to the places that took my breath away.Let it blow me about to return to those places..That I swore were so magical I would return,But have not,Let those forgotten shores, forgotten places,Be reunited with my eyes,The splendour and the overwhelming feeling of sheer happiness,Etch into my soul as I pass through one heaven into the nextWhere I shall live for eternityKnowing I made a promise and kept it,I forgot nothing,I left nothing behind,My loved ones will greet me or follow me,My broken promises were fixed,And the screams in my ears of a conscience I couldn't escape,Faded to whispers,Till one day I shall return to Earth in a new vessel,Reborn to live and suffer and wish this wish of mine all over again,Knowing the fulfillment of being forever free…." 4. "Religion provides the only story that is fundamentally consoling in the face of the worst possible experiences - the death of a parent, for instance. In fact, many religions take away the problem entirely, because their adherents ostensibly believe that they're going to be reunited with everyone they love, and death is an illusion." 5. "My team and I have reunited two elements that coexist with difficulty: respect and affection, because when they love you they don't respect you and when they respect you they don't love you." 6. 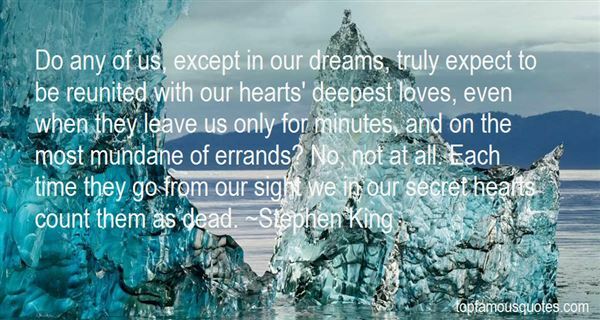 "Do any of us, except in our dreams, truly expect to be reunited with our hearts' deepest loves, even when they leave us only for minutes, and on the most mundane of errands? No, not at all. Each time they go from our sight we in our secret hearts count them as dead." When you are writing a song for something else, if you are doing something for money, I always think that's bad luck."